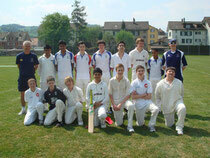 Two cricket camps, one in the West, one in the East of Switzerland took place during the Easter/Spring school break. The 52 players had all been selected by their coaches and clubs as potential players for three Swiss national teams. The Swiss U11/12, U13 and U15 teams will all be touring abroad this year. The Under 12 team will be hosted by Oxfordshire in August. The Under 13 team will play in Vienna in June and then at the four-day Powerplay Cricket Twenty20 Festival at Epsom College in August. This festival, for nine elite teams, includes Dorset U13, East Berkshire U13 and London Counties Academy and will be a tough test for our young players. The core of the team, though, toured successfully in Denmark in 2010 and not without valuable experience at this level. The Swiss Under 15 team first travels to Cambridgeshire in June and then to the prestigious European cricket festival in Denmark in August where they will also encounter Holland and Belgium. The first camp comprising four days of cricket (25-28 April), three of them with Hampshire coaches John Cook, Hampshire’s Cricket Development Officer who also currently manages the Coach Education and Holiday Course programmes, and Chris Wheeler, who is heavily involved with Hampshire age group cricket as the current county U12s head coach, took twenty-eight junior players in Switzerland to new heights. 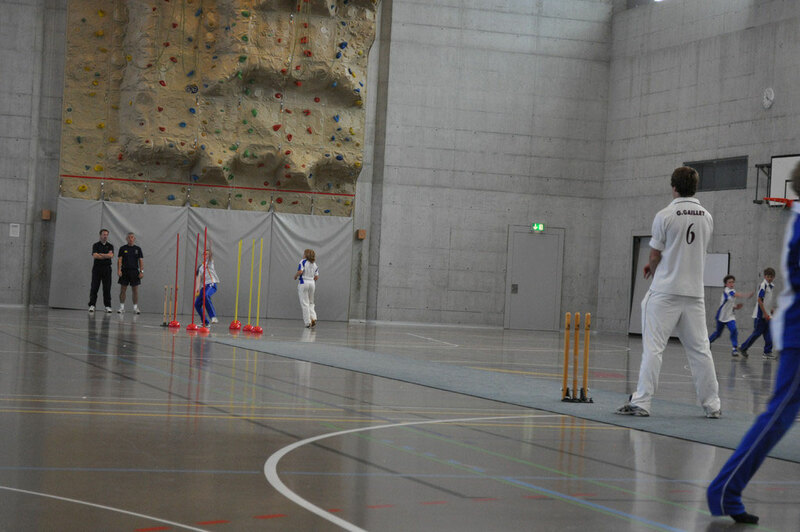 The camp was run mostly at the Zurich Crickets CC huge indoor match facility at the Zurich International School in Adliswil, and due to the fine weather the Deutweg ground in Winterthur was also used. The second camp was a two-day event which took place at the International School of Geneva’s excellent facilities in Founex, Vaud. 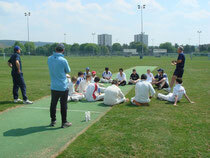 It was run by Gingins CC who was hosting Manoj Parmer for a weekend of extensive coaching. Manoj is an experienced professional player who has played first class cricket in India, and an elite coach with an obvious wealth of knowledge and skill with players at this level. 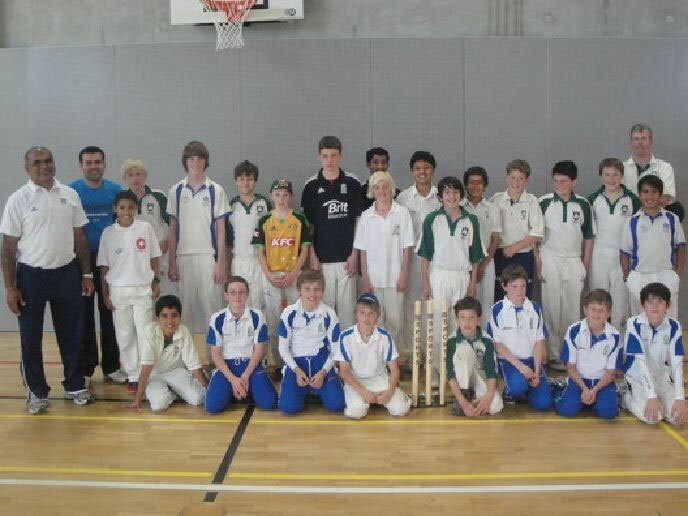 In total the event was well attended with 24 budding cricketers, representing most of the current Under 11/12/13 Swiss squads, attending the event. The players were from a diversity of clubs including Zurich, Basel, Cossonay, Geneva, CDL and Gingins. Stephen Hirst, Swiss U15 manager, having reflected on the three days of coaching the players received, commented that these sessions were by far the best sessions the East of Switzerland had ever organised. “Our boys listened intently to the words of advice and encouragement given by both John Cook and Chris Wheeler. Their constant observations continually helped our players gain the most from each of the sessions. The highlight of the week for me was the game we played at Deutweg on Tuesday afternoon. The coaches divided our players into two evenly matched teams and each coach took responsibility for one of the sides. The coaches constantly gave their players advice on the things they could do to improve their effectiveness with both bat and ball. Half way through each innings they called a ‘time-out’, during which they discussed the things their players had done well, the things they had done not so well and, most importantly, the things they could do to improve their team’s overall performance. The standout thing for me about this particular session was the way they discussed the tactics their team should consider introducing to improve their overall performance. Little things, like when you are batting try to score an extra run per over by maximizing the use of singles, when you are bowling maintain a tight line and length so you do not give away unnecessary additional runs with wides, and, most important of all, select your field positions so you make it difficult for your opponents to score their runs. Cricket is “a simple sport complicated by us.” This was one of the first things that the coaches said to us. They gave us many words of wisdom throughout the course, but the one that really sticks in my mind is whenever a batsman, no matter what level they are at, is struggling with form, they go back to basics. Playing in that all important V and trying to time the ball rather than belt it out of the park. The most interesting statistic which I can take from the course is that 75% of teams with the most singles scored in a T20 match win. When you think about it, it makes sense because if you have 20 dot balls in an innings for example, then that is twenty opportunities which have been missed, but if you change those dots into singles then you have twenty more runs to work with. The highlight of the week would have to be the match which we played on Tuesday afternoon. Not only because the weather was gorgeous but also because we had done lots of work on our tactics the day before, so trying to implement those changes was an interesting and a difficult challenge. Overall the week was extremely enjoyable and would definitely be one that I would like to repeat. All of the tips which I received throughout the three-day course helped me to improve my game and make me a better player, and I am sure that it will have done the same for others as well. I think, in conclusion, that the combined skills of our coaches complimented each other and as a result our boys gained the maximum benefit from their three afternoons of intense coaching. It is now our responsibility as coaches and players to make sure we continue to develop and improve on the new skills we have learnt, so when both coaches return next year they can say to us that all our players have continued to improve. I cannot wait until they return next year. From the warm up on Monday to the final game on Wednesday, the U11 and U13 players benefited from intense individual training from John Cook and Chris Wheeler of Hampshire CCC. The intensity and focus on the individual is both invaluable to the players and difficult to achieve, though we try, in to our normal weekly schedule. Consistent messages from all of the activities: 1) Think when you play. Think all the time. 2) Be balanced when you play. Balance is vital. All the time. 3) Make your life easy by good technique. Know the technique, make it what you do. All the time. Go and have some water. Next focus: Playing straight and bowling actions. Get these right, and you are a much more solid cricketer. The players donned their batting equipment and spent time with Chris. It was interesting to see how little the messages changed from player to player, from the most experienced U13 to the youngest U11. Be grounded: stand in the right place, always. Be balanced. Without balance, you cannot have good technique. Think: do I have to play this? Or, can I play this without risk? Think about every ball. Most importantly, watch it, wait for it, whack it. Wait for it. Wait for it. Wait for it. Player after player. Let it come to you. Wait until it is below your head. Get your head to the line of the ball, and play when it reaches you. With a couple of simple techniques building this up, the pleasure each player showed as they tried and consciously felt the technique advised, they learned what to try to do, and, yes, to do it, and wow, that felt great! ...was a real joy to see. Meanwhile, John was examining everyone's bowling techniques and giving tips to consider, things to try. Everyone was able to benefit, from the "so if I change that small thing I will become more in control? Oh, wow, it works! ", through to reworking of actions with more to work on. And if we have 5 stumps to aim at, do we bowl the batsman more often? John Cook on technique: It can be overrated. What? Even if you don't have the best technique, you can win your games. How? Tactics. Thinking. Watching what the other team is doing and responding to it. Fielders there? Play here. Misfield? Cheeky run. Batsman playing wide of that fielder again and again? Move the fielder. By thinking, playing attentively, you put pressure on the other side. Good technique is always tested by pressure, by good tactics. It is wasted when tactics are less good. Let's try it in a game. Quick cricket, but batsmen scored bonus runs for playing straight, assessing risk by choosing how many runs to run. Second team to bat got the advice from Chris: Think – if you play straight, you will easily win. That is where the big scores are. Second batting team won easily. Day 3: back to batting. Did we remember what we practised on Monday? Two bowling machines and four Zurich coaches fed the batsmen ball after ball to be driven, driven, driven. Come further forward. Are you really balanced? Wait for it. Was that really a whack? Better. Better. Good. Over after over after over faced, a good two months of normal coaching squeezed into the one session. Wow! Then a big game to finish. We coaches had no doubt that the players were likely to have slept well between the course days - and probably dreamt of cricket! The messages were not different from our regular messages, but they were supercharged and delivered with such bespoke care from such experienced professional cricketers, each player benefited hugely. - We had learned a great deal. Balance, thinking, straight lines being at the top of the list. - We had put into practice what we had had suggested, again and again and again. - We were given the confidence that perfect technique is not everything. Even if your technique is imperfect, if your tactics are good, you will win. One can be very proud of the approach taken by the U11 and U13 players to all of the activities on the course: they all really wanted to learn. Everyone was fully engaged, trying hard. This was specifically commented on by Chris Wheeler, who loves his job when he is with people who want to learn, but feels terrible when they do not. He, too, had really enjoyed his three mornings. Best of all, throughout the course, only encouraging comments could be heard, regardless of the breadth of experience represented. This encompassed the spirit of cricket perfectly: respect for others, generous enthusiasm for their improvement. Another lasting benefit will be the coaching techniques the local coaches were able to observe to put directly into practice with all their club members. To learn so many different ways to emphasise and reemphasise the core skills, each simple but with great variety, was of great help. 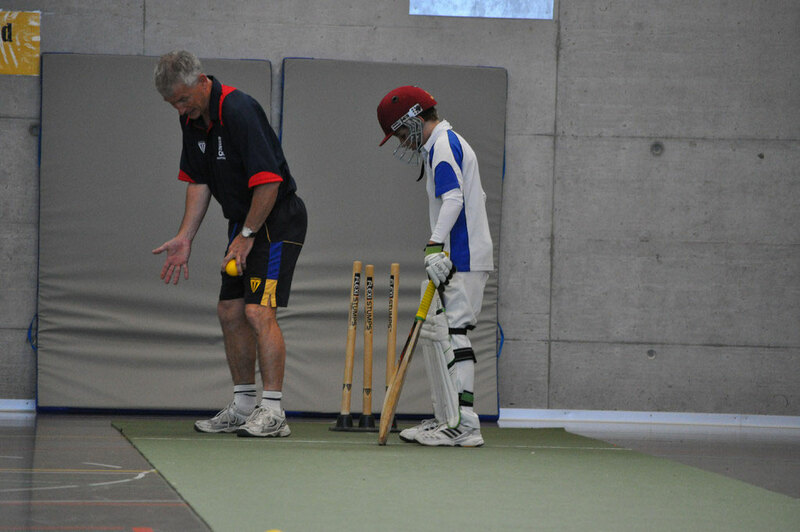 On the weekend of 30 April the Under 11 and Under 13 Swiss squads hosted Manoj Parmer for a weekend of extensive coaching. Manoj is an experienced professional player who has played first class cricket in India as a batsman/keeper for 11 years and been a player/coach for 26 years in total, with spells at professional clubs in India, England and the US. He has played competitive matches in India, England, Africa, Dubai, Scotland, the US and Holland, and is now a highly regarded professional coach in the UK. It was during his spell as a professional in the UK that he set up MP Sports in Thame, Oxfordshire in 2008. The two-day event took place at the International School of Geneva’s excellent facilities in Founex, Vaud. In total the event was well attended with 24 budding cricketers, representing most of the current Swiss squad, attending the event. The current squad reflects the diversity of the junior game and the nationwide appeal of cricket with children attending from clubs including Zurich, Basel, Cossonay, Geneva, CDL and Gingins. The group embarked on numerous exercises all relating to one of the central factors above. These ranged from mental challenges to basic technique demonstrations and tactics tests. Manoj related experiences from critical points of matches he has been involved in and passed on invaluable tips on how to deal with pressure and how to navigate through matches with tactics that work. He mixed into this approach a healthy dose of technical skills, demonstrating a wide array of batting shots, bowling variations, and fielding technique by giving simple tips on how best to execute them and in which match situations these would be best employed. It was clear to all that the junior players gained tremendously from Manoj’s passion, experience and engaging approach towards the game of cricket. 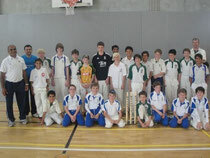 Following the success of this event, Manish Jain and Scott Poynton, the current national coaches for the Under 11 and Under 13 teams, are investigating options of engaging with Manoj on a more regular basis, both for the national team as well as the club side they run, Gingins Cricket Club, in the Vaud area of Switzerland. In summary, the junior Swiss Teams gained a great deal from the event. An added benefit was that the Swiss junior coaches present learnt some useful technique insights and match relevant tips to help their players in the future.